I'm sharing a non-food-related subject with you today. Along with my passion for food is a passion for design. Part of that design-life includes creating beautiful invitations and other wedding-related items for Brides and Grooms to be and nothing makes me happier then helping others be happy on their wedding day. I was approached by Laura after her mother showed her the invitations I did for Dustin and Lauren. You can imagine my surprise when this girl from Wisconsin loved what I did so much that she wanted to work with someone so far away on something so personal. She loved everything I did on those invitations so she wanted to go with that same style. It was the ever-popular metallic paper in a pocket-fold enclosure. You can't go wrong with a self-holding piece of paper! Laura and Max's colors were gold and black and the event was to be very formal. She was looking for a custom design that reflected their personalities and would compliment everything else. The handmade invitations consisted of the metallic gold pocket, a complimenting, custom-printed RSVP envelope, and enclosure reception and RSVP cards printed on white metallic paper. All the pieces were accented with a faded lily which was the flower featured in her bouquet and a couple gold jewels on the main invitation card brought the whole theme together. 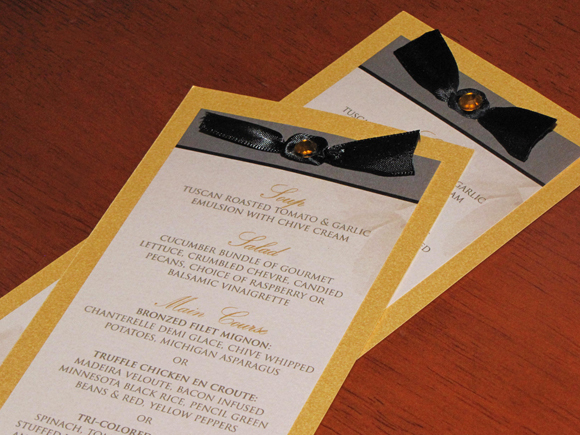 The pocket-fold was secured with a black satin ribbon to keep the formality throughout the entire package. I also created a few other pieces that were used at the ceremony and reception. 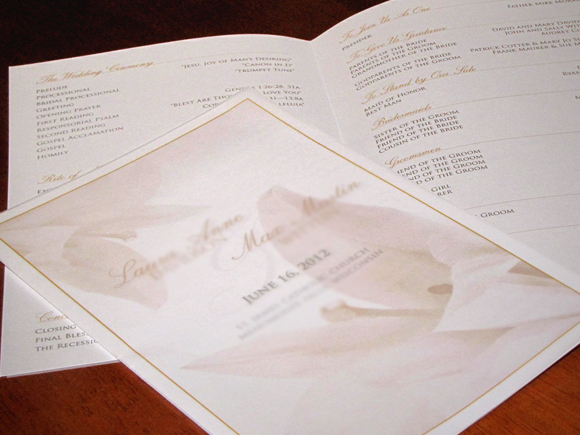 Programs were designed with that same metallic white paper and then the book-style program was covered with a simple vellum to offer softness and keep the feel of the ceremony light, but formal. Menu cards were also designed to greet the patrons at their seat. 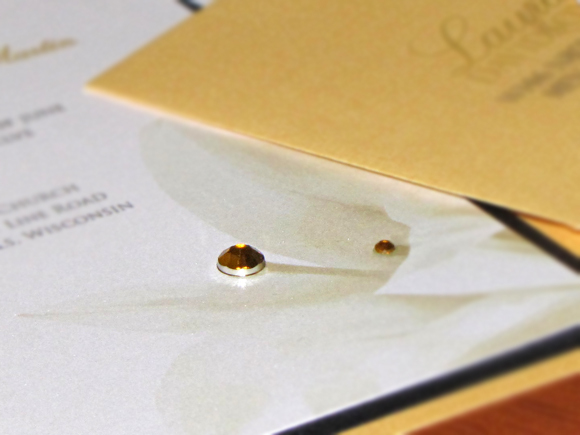 The same gold from the invitations was used a the backing and the white metallic paper offered the information. 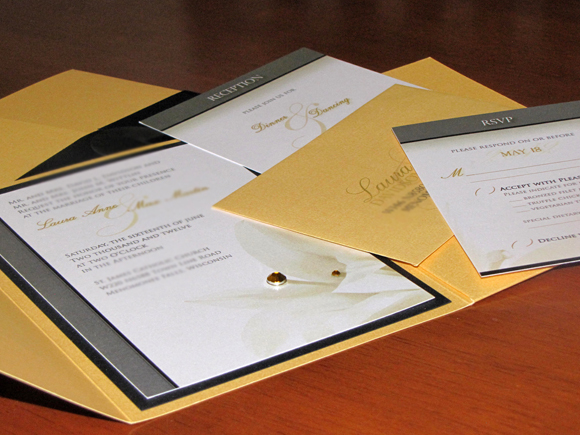 Each card had the gold and white paper secured with a black satin ribbon which was accented with a gold jewel. Colors and design of cards are complementing each other. Can't forget the materialistic set up at my friend's sister wedding dinner few weeks back. One of the most popular event venue was booked online and discount offered was also tempting. Liked the dinner table management and rich preparations of food.